Rihanna you’re a Womble ! Quickly, because this might confuse older readers, younger readers and No-Telly Neville. Rihanna is a current pop star, with a substantial batch of hit songs and is also a fashion icon for young people – she is cool. 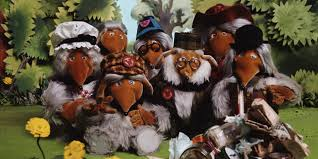 The Wombles are a group of fictional furry creatures who live on Wimbledon common and who make good use of the things that they find, things that the everyday folks leave behind. They pick up rubbish. You are probably asking yourself at this point, how the Wombles and Rihanna come together in the English Courts – and possibly also whether there is a musical collaboration in the offing. I will relate to you, how their histories enweave. The case was about Topshop selling a T-shirt with a photographic image of Rihanna, and Rihanna suing them. The Court of Appeal point out quickly that in England, unlike America, there is no such thing as “image rights” – Rihanna, as a celebrity, does not own the copyright in her image or photograph or appearance. The copyright lies with the creator of the photograph, who had consented to its use. the law of passing off is not designed to protect a person against fair competition. Nor does it protect a person against the sale by others of the same goods or even copied goods. What it protects is goodwill and it prevents one person passing off his goods or services as those of another. As Lord Oliver of Aylmerton explained in Reckitt & Colman Products Ltd v Borden Inc & Ors  RPC 341 at page 406, a claimant must establish three elements in order to succeed in such a claim. First, he must establish a goodwill or reputation attached to the goods or services which he supplies in the mind of the purchasing public by association with the particular name or get up under which the goods or services are offered to the public, such that the name or get up is recognised by the public as distinctive of the claimant’s goods or services. Second, he must demonstrate a misrepresentation by the defendant to the public leading or likely to lead the public to believe that the goods or services offered by him are the goods or services of the claimant. Third, he must demonstrate that he suffers or, in a quia timet action that he is likely to suffer, damage by reason of the erroneous belief engendered by the defendant’s misrepresentation that the source of the defendant’s goods or services is the same as the source of those offered by the claimant. That she suffers loss or potential loss as a result of people believing that this was an official or endorsed product. Would she win, or would Topshop be able to say that Rihanna had found love, and a hopeless case? The judgment is worth reading – the original trial Judge had been very switched on and in touch in relation to Rihanna, celebrity culture, young people, viral marketing and fashion, including that the item Rihanna was wearing on the unauthorised T-shirt being a “bralet” – and resisted, where I would have not, of saying it was a bralet for a starlet. Finally, the judge dealt with damage. He considered that if, as he believed to be the case, a substantial number of consumers were likely to be deceived into buying the t-shirt because of a false belief that it had been authorised by Rihanna then that would obviously damage her goodwill. It would result in a loss of sales to her merchandising business and also represent a loss of control over her reputation in the fashion sphere. It was, he thought, for her to choose which garments she endorsed. In all the circumstances, Topshop’s sale of the t-shirt without her approval amounted to passing off. I enjoyed the detail that Topshop had commissioned some market research prior to the trial, getting people to look at the T-shirt and comment as to whether they thought it was an official piece of Rihanna merchandise. They called the author of that research. Mrs Armstrong is a trainee solicitor in the defendants’ solicitors currently seconded to the legal team at Arcadia, the parent group of the defendants. She gave evidence of efforts she had undertaken to find out if Topshop staff were aware of any feedback from customers concerning the t-shirt. She was a good witness but I am not satisfied the exercise Mrs Armstrong described was sufficiently rigorous to establish the proposition advanced, that there had been no comments or relevant feedback relating to the product. For God’s sake, Suesspicious Minds, I hear you cry. I did not start reading an article called “Rihanna, who loves you baby?” – where the chuff are the Wombles? Rihanna wins the Court of Appeal case, just as the Wombles won their own case about protecting other people using their image to sell unauthorised products. So Rihanna, you’re a womble. Comments Off on Rihanna you’re a Womble ! Posted in case law, stuff that isn't law at all and tagged celebrity image, fenty v arcadia, image rights, passing off, rihanna, wombles. Bookmark the permalink.